Any other name will not allow us to cash the check and will cause a delay in processing your order as we will have to return the check to you. Before asking us for a quote on a carburetor assembly rebuild or purchase, check our website for pricing. Prices for rebuilds will be in the Carburetor Rebuild webpage and for a purchase in the Carburetor Sale page. We don't nickel and dime our customers; the price you see is the price you will pay. We re-jet, if needed, at no additional charge and provide free return shipping to US customers (see our IMPORTANT INFO link for shipping costs to non-CONUS customers). 1. New diaphragms for constant velocity carbs if we don't have spare diaphragms for constant velocity carburetors and have to buy replacements, there will be an extra charge. 2. Some assemblies use rubber covers over the sync mechanisms and they are usually shot. If you need new ones, there will be an extra charge as these are not part of a normal rebuild. 3. Brass floats frequently leak and have cracks and if we don't have suitable used parts to replace the bad ones and need to purchase new, then there will be an additional charge. If you don't see your bike listed, use our "CONTACT US" page for a quote (not our Customer Order Form). Our pricing is per carburetor assembly and not for a single carburetor. We don't charge extra for repairs; that is part of the service. We also don't gouge on parts that are needed but only charge what we actually pay plus shipping. Many times, we will have spares on hand and if we use these, there is no additiional charge. We REMANUFACTURE and SELL selected vintage carburetor assemblies. We REBUILD customer supplied carburetor assemblies. If we sell OR rebuild, we replace parts that need to be replaced and make necessary repairs as part of the included cost EXCEPT if the needed parts are rubber slide diaphragms or certain other parts of this nature not normally included in rebuilds. An example of this type part would be a carburetor body we can't replace from our spares because it is unserviceable. We also work on more modern carburetors, ask us for a quote. 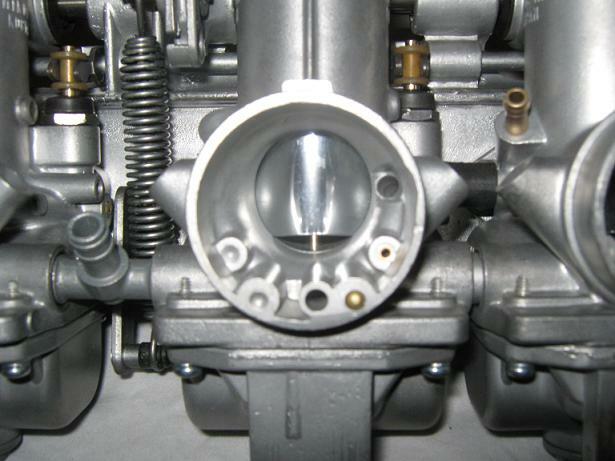 We have found that local dealerships won't work on carburetors older than just a few years old and with the quality of gas questionable, the need for carburetor work has grown into the more modern motorcycle segment. We can NOT provide free tech help to non-customers as it takes away from our time working for our paid customers. We do not sell carb kits, carburetor parts or non-remanufactured assemblies. We can not make stand-alone repairs on damaged carburetors or provide tips on how to repair them. Active duty military stationed in the US receive a 15 percent discount in appreciation for their service. You will need to pay for carb service or carb purchase using PayPal. Payment MUST be made within 24 hours of invoice issue or the discount will be withdrawn. The discount applies ONLY to the cost of a rebuild or carburetor assembly purchase and not to Texas state sales tax (if you are stationed in Texas) or additional services such as paint removal or sync, tuning and road testing. To receive this discount, the member must proof of current service by scanning an ID card or sending an email from a .mil address. Firefighters/LEOs must scan an ID.